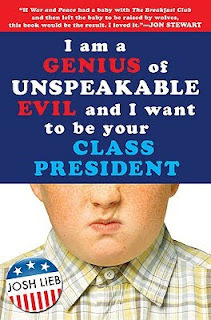 I'm a Genius of Unspeakable Evil and I Want to Be Your Class President by Josh Lieb. (Grades 6-8.) Razorbill, October 2009. Reviewed from ARC provided by publisher. Oliver Watson is an evil genius and he will stop at nothing to win the election for 7th-grade class president. And when I say "Nothing", I mean it. Due to his intellectual genius, Oliver has riches beyond belief and commands a huge staff equipped with the latest technology (much of it invented by Oliver himself). Of course, it's all secret and Oliver pretends to be slow at school and at home, so no one suspects. Buckle up. You're in for a wild ride with Oliver Watson, evil genius. I mean, with a title like that, do you even need a review? Kids will pick it up. The good? It's funny. Oliver's got a very dry humor and he has the means to get back at bullies like we all dreamed of when we were in middle school. His classmates, teachers, and parents never suspect that Oliver is a secret billionaire with the power to get literally anything he wants. This makes for a very funny premise. The bad? The humor and premise that originally hooked me got tiresome long before the book ended and then I realized that not a whole lot was happening. The plot moves slowly for all the secret lairs, crazy technology, and evil genius-ing. That said, this book isn't for every kid, but for some kids it will be a great fit. Betsy suggests that it's perfect for Diary of a Wimpy Kid fans (read her review at A Fuse #8 Production) and goodness knows we have enough of those around... You can find more reviews at Frenetic Reader and Enchanting YA Reviews. Hi Abby - I haven't read this, but wanted to give some student feedback. I can imagine the humor gets tiresome, but I have a 5th grade boy who ate this up. He loved it so much that he turned down his usual video game time to keep reading! That's pretty hot stuff IMO. Hmmm....I'm wondering if my 4th grader would like it? I really appreciate your review of this one. I have read it and plan to review it soon. I, personally, thought the story was a little dark and sarcastic for a tween audience, but I know a lot of young teens who would gobble this one up. I think it works for its target audience. I know there is a sequel planned, too. The title of the book alone cracks me up! I can't say it's really my type of book, but the title gets me. I like how you explain "the good" and "the bad" of each book. Helpful points to know! I guess I enjoyed this book, but I started getting the "aren't I so clever" vibe from the author. I have yet to try it out on a kid, though, and what I'm hearing in the rest of your comments here indicate that they don't mind too much. I had to add it to my next book order based on the title alone. I will target it to the Wimpy Kid fans. It doesn't really sound like something I would choose for myself but I do have bunches of kids who love this kind of thing. To my surprise, two 14 year old girls who are both quite intelligent and good readers thought this was hilarious. I tired of the adolescent humor, but I expect a lot of boys who are reluctant readers might enjoy the laughs enough to get through the book.